President Obama Preparing To Take Executive Action On Guns "The president has made clear he's not satisfied with where we are, and expects that work to be completed soon," said White House spokesman Eric Schultz. A federal rule requiring background checks doesn't apply to some of those doing business online and at gun shows, like this one put on by the National Rifle Association in April in St. Louis. Changing that exception is one idea that has been floated to the president. President Obama is preparing to take executive action on guns soon, after being rebuffed by Congress in his effort to crack down on gun violence. 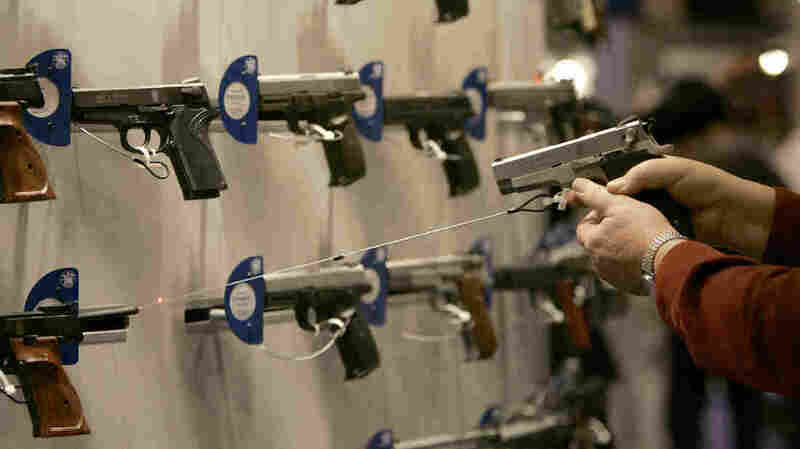 Gun control advocates say the move could come as early as next week. "The president has made clear he's not satisfied with where we are and expects that work to be completed soon," said White House spokesman Eric Schultz. Obama has been frustrated by his inability to push gun safety legislation through Congress, despite a major effort three years ago after the shootings at Sandy Hook Elementary School in Newtown, Conn., which left 26 people dead including 20 children. After another deadly massacre in October at an Oregon community college, Obama asked his advisers to look again for actions he could take on his own. One idea that has been floated is designed to narrow the number of gun sales that take place without a background check. Federal law requires licensed gun dealers to conduct background checks on would-be buyers before selling firearms. But the rule doesn't apply to some of those doing business at gun shows and online. "That represents a huge loophole in the existing background check system, which otherwise is a very useful system for keeping guns out of the hands of dangerous people," said Ted Alcorn, research director for Everytown for Gun Safety, an advocacy group founded by former New York City Mayor Michael Bloomberg. Gun safety proponents have urged the administration to tighten the rule governing which gun sellers must conduct background checks. They argue the current rule is too vague, allowing a small number of rogue dealers to skirt the law and sell a large number of guns to unscreened buyers. Gun rights advocates disagree, and they've promised to challenge any move by the president to rewrite the rules. "We don't have a king in America, but he's acting like it," said Dudley Brown, president of the National Association for Gun Rights. Congress considered, but rejected, a bill to require universal background checks in 2013. Both the White House and gun safety advocates acknowledge the president has limited powers to combat gun violence on his own. "This is not something I can do by myself," Obama said after the community college shooting in October. "I've got to have a Congress and I've got to have state legislatures and governors who are willing to work with me on this."